In 1992, American artist Art Spiegelmen released the graphic novel Maus; an autobiographical biography of his father’s experience of World War Two, where the Germans are shown as cats and the Jewish people are mice. It’s about the Holocaust – but it’s also about his strained relationship with his father, the loss of his mother and his battle with depression. Its release was something of a revelation for critics, showing that the graphic novel genre could be just as adult and literary as any other medium. It’s also spawned a genre of itself – the graphic novel autobiography. Since Maus, the market has been flooded with books in this vein. The most well-known and respected of these are probably Persepolis by Marjane Satrapi and Fun Home by Allison Bechdel, which have also received incredible critical acclaim. Whether about war or family, the undeniable draw for those who write these stories is the exploration of their own internal landscapes, as well as their external ones. Blankets is a perfect example of this. Set against the snowy landscapes of Michigan and Wisconsin, it tells the story of Craig Thompson’s journey to adulthood through religion, a troubled childhood and the whirlwind of his first love. Nowadays it’s not discussed much, but after its release in 2004 it received three Harvey awards and two Eisner awards. It’s a subject matter that you might roll your eyes at – an artist writing a memoir about being a sensitive, lovelorn teen. Compared to some of the other autobiographies that have been released in recent years it seems like an inane and boring story to tell. Does Blankets have a story worth reading? The answer is yes, it does. Everyone should go check this book out. 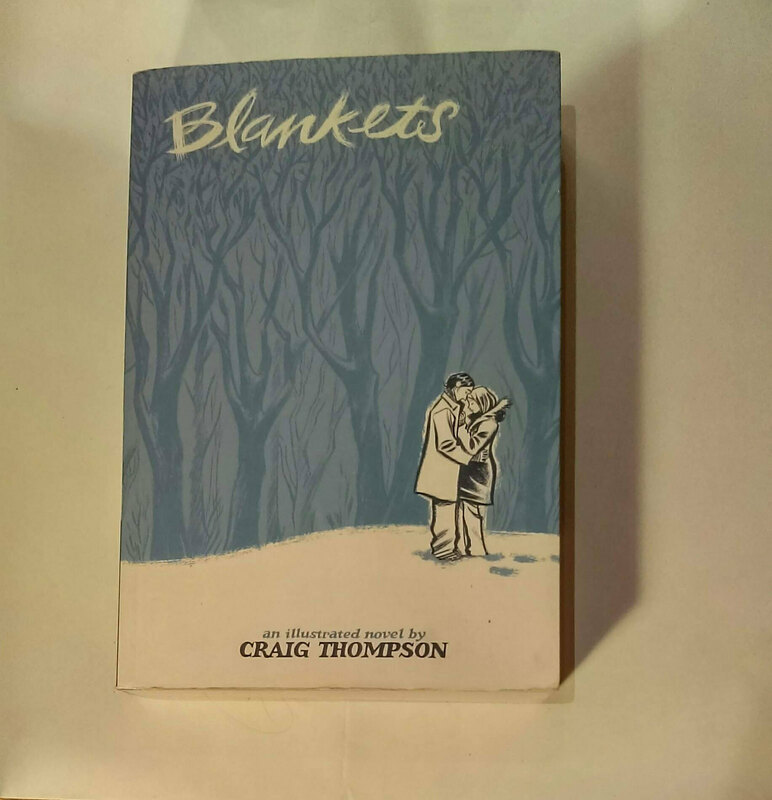 Craig Thompson’s story beautifully navigates his childhood traumas and the effect of his heavily religious upbringing on his life, love and art. The blossoming romance with Raina – a girl he meets at church camp – is frankly and honestly told, but also draws you deeper into their relationship than I think could be achieved by another medium. Thompson’s art works perfectly in conjunction with his perfect, lyrical writing, which is integral to the book, conveying the inner workings of his mind far better than any words ever could. Every panel feels essential in conveying something important about the characters or the significance of the events being depicted. But by far my favourite element of this book is how he depicts his relationship with his brother. Flashbacks of them together as children are scattered throughout the story, but this subplot does get somewhat forgotten about amidst the teenage romance. It’s a deliberate move on Thompson’s part, and these flashbacks are all tinged with hints of regret, guilt and nostalgia. For me, these were the most beautiful, poignant moments in a very beautiful, poignant graphic novel. Entertainment Weekly described it as “virtual poetry”, and there is no better way of putting it.